Beware of any dangers dealing with electricity or where high voltage is present. To notify anyone who may come into contact with a situation involving electricity, you are responsible for posting signs indicating the potential danger. This 12" x 18” High Voltage Symbol Danger aluminum sign will provide safety for anyone who approaches the area and will keep you in compliance. These signs are printed on vinyl and mounted to heavy duty .063 aluminum. Two pre-drilled holes are at the top & bottom for easy installation. Aluminum has 1.25” radius corners to protect you from sharp edges and gives a professional finished appearance. For longer life of your printed sign, add lamination for a few dollars more. Lamination helps protect from UV rays to extend the life of your signs and is recommended for outdoor signage. For indoor use, the vinyl print & aluminum will last for several years. 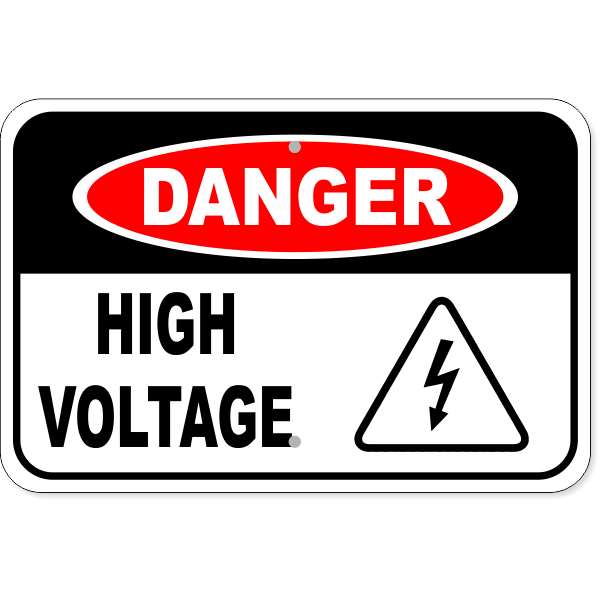 Make sure you are in compliance with OSHA regulations and order your High Voltage Symbol Danger Signs today. Most orders ship the next day!